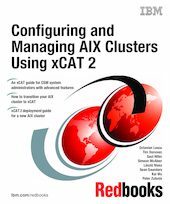 This IBM® Redbooks® publication positions the new Extreme Cluster Administration Toolkit 2.x (xCAT 2) against the IBM Cluster Systems Management (CSM) for IBM Power Systems™ running AIX in a High Performance Computing (HPC) environment. - Understand, from a broad perspective, a new clustering management architecture. We emphasize the benefits of this new solution for deploying HPC clusters of large numbers of nodes. - Install and customize the new xCAT cluster management in various configurations. - Design and create a solution to migrate from existing CSM configurations to xCAT-managed clusters for IBM System p platforms running AIX.